Size matters! If you ask the manufacturers of Head Mounted Displays over the past 15 years, they would echo that mantra, but it’s SMALL size that they’re boasting. Indeed, those tiny little eye glasses size VR displays look cool (from the outside), but from the inside you’re looking through a distant window. It’s hardly immersive. Read on for an explanation why bigger is better when it comes to immersion. This illustration demonstrates why you need large lenses and therefore large displays in order to achieve very wide field of view. You’re looking at a top view cross-section of the eyeball, lens, and display. The blue lines show the extreme periphery of an unmoving eyeball’s horizontal field of view. The dim red lines demonstrate what happens when the eyeball turns to the left. So… getting back to the unmoving eyeball. The lens (or multi-lens optics) is fairly close to the front of the eye, certainly as close as your sunglasses would be. The lens needs to have a diameter that is large enough to intersect the blue lines in order to allow us to see the display at that field of view. You must look through the lens for all possible angles, not around it! Human anatomy permits extremely wide field of view because the eyeball can rotate around its center. The dim red lines show the maximum field of view with the eyeball turned to the left. Another problem is encountered: the lens must be bigger because the eye rotates around it’s center, not around its own biological lens. Perhaps the lens could be made smaller and moved closer to the eye? More problems occur. The turning eye issue becomes magnified. Also, the lens must be aligned much more precisely with the eyeball. We could potentially solve the turning eye problem by fabricating the lens as a contact lens, but this would require a very high diopter lens to work properly with a small display; unfortunately beyond what is possible with current contact lens technology. 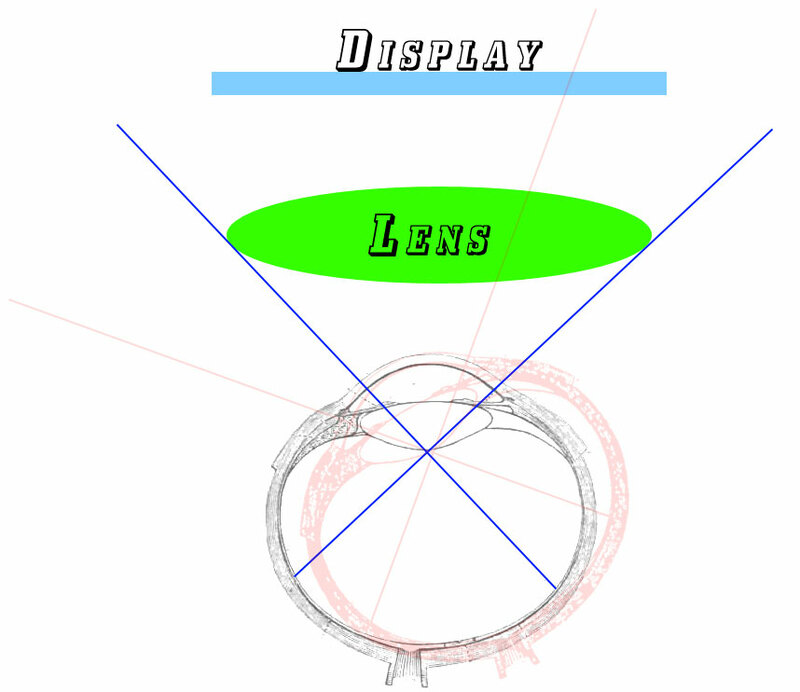 Furthermore, since the display is not physically coupled to the contact lens nor the eyeball rotation, the display must still be large enough to encompass all the possible rotations of the eyeball. Finally, the contact lens approach makes it difficult to transition between the virtual world and the real world, as the contact lenses must be removed and applied each time. Now here’s the gotcha. For a display panel of any given resolution, when it is displayed at a wider field of view, it will look grainier than if displayed with a narrow field of view. You can test this one in the comfort of your own living room. Watch your beautiful 50 inch 1080p TV set from 10 feet away. Looks pretty good, huh? OK, the picture doesn’t exactly fill your visual world, in fact, most of your vision encompasses those left over pizza boxes and the other trash that you forgot to clean up last night. Now park your nose about one foot away from the same TV set. Wow! That’s immersive! You’re getting something like 110 deg. FOV. Uh oh! What are all those dots on the screen? Sure looks fuzzy. Same 1080p resolution that looked great a moment ago at 10 feet now looks low res and grainy. 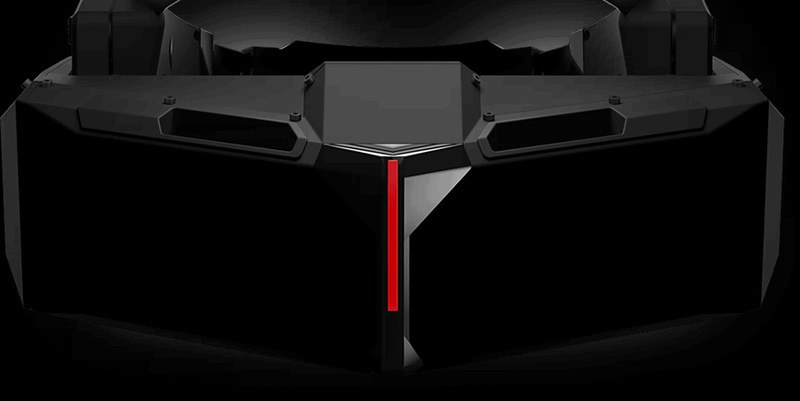 Why do you think Head Mounted Display manufacturers love narrow field of view?